'Daughter Of Shiraz' OGB+ (Leo Clark by Virginia Ross, R. 1980). 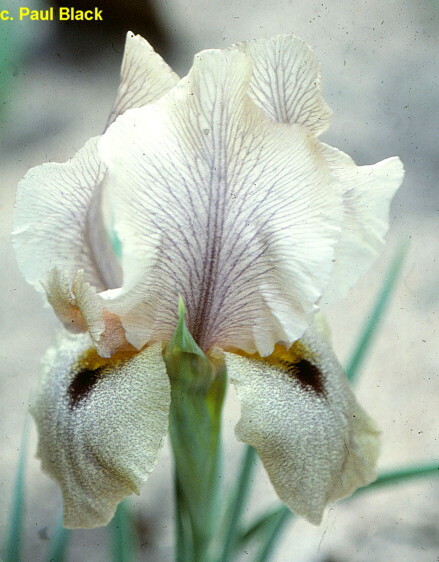 Seedling 192VC773C. AB, 14" (36 cm). Early bloom. Standards ruffled snow white; white styles with hint of mulberry on arms; Falls white with very fine dotting of mulberry; dark mulberry signal diffusing at edge; pale yellow beard. 'Moon Over Shiraz' X 'Syrian Moon'. sib. Aril Society, 1980.